Choose from a huge selection of spaces near Rochester Auditorium - including on-street parking, off-street car parks and 0 reservable spaces. Finding parking near Rochester Auditorium is easy with JustPark. As The Parking App, we’ve got your needs covered whenever you’re visiting – plus you can even reserve your space with us in advance, for the most peaceful parking experience possible. Enter your dates and times to see availability and price information, so you can pick the most suitable space for your journey to Rochester Auditorium. 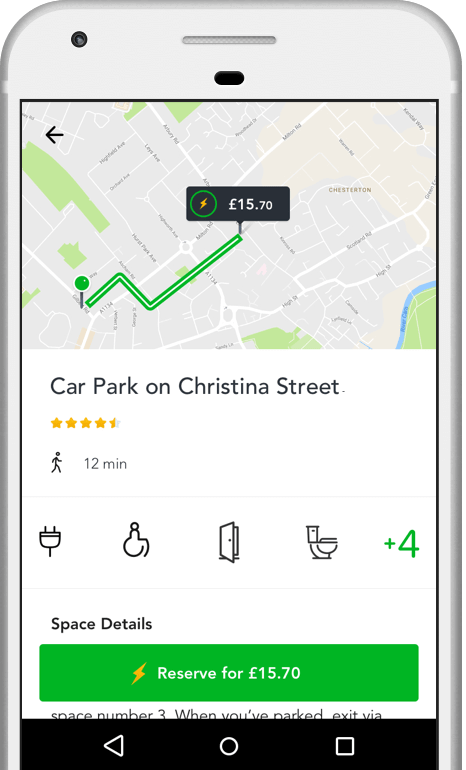 Any spaces with the lightning bolt icon can be reserved and paid for in seconds via the JustPark app and website – meaning a guaranteed spot waiting for you on arrival, and no hassle searching for a space or for coins. Our spaces start from just £ per day. Rated 5 stars with an average satisfaction rating of 96%, JustPark is the UK’s favourite parking service. With millions of spaces in thousands of towns and cities, we’re making parking easy for over 2million drivers – at Rochester Auditorium and across the country. But don’t just take our word for it – check out some of the latest customer reviews for our Rochester Auditorium parking spaces at the bottom of this page. To find information about parking near Rochester Auditorium and see what’s available for your journey, you can use the search form at the top of this page. JustPark offers a choice of reservable off-street parking options near Rochester Auditorium – from public car parks to private driveways. You can browse options and book a guaranteed space via our website or app. There is plenty to see and do near Rochester Auditorium, plus access to public transport connections to take you further afield. You can find parking closer to nearby sights and amenities below. Rated 5 stars with an average satisfaction rating of 96%, JustPark is the UK’s favourite parking service. But don’t just take our word for it – check out some of the latest customer reviews for our Rochester Auditorium parking spaces at the bottom of this page.